Local people come to study and practice zazen at Busshinji. The Buddhist temple that is the site of the Soto Zen Buddhism South America Office was founded in 1955 by Takashina Rosen Zenji. When he was 80 years old, he spent about three months in Brazil performing propagation work. On November 30, 1955, only a few days before his return to Japan on December 2, he designated the temple as a branch of both main temples, Eiheiji and Sojiji, in his capacity as Sotoshu Head Priest. At present there are six Sotoshu temples in Brazil and one in Peru. 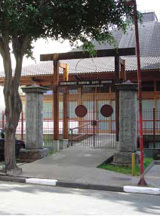 As there are roughly 1.2 million people of Japanese descent living in Brazil, six temples is anything but a large number. However, the existing temples serve as a place of refuge and are constantly seeking to provide a friendly environment where people feel welcome to just stop by. These temples are truly diverse in terms of location and activities performed. One temple acts as a venue for local residents to interact, welcoming many people whenever there is an event; one boasts of an endless stream of visitors, taking advantage of its convenient location to offer various lessons, workshops and bazaars; one has an adjoining cemetery surrounded by a tranquil natural environment; and still another provides a Zen meditation hall for companies and schools where people can study and train. The teachings of Our Two Founders are widespread, even on the other side of the world in South America. As part of the activities of the South America Office, baikaryu special teachers and special dissemination teachers are invited annually and make rounds to temples and various communities. In recent years, Zen meditation as taught by Dogen Zenji has spread around the world, and South America is no exception. There are 100 or more Zen meditation groups both large and small throughout the continent. One role the South America Office plays is to keep in close contact with these groups and help them create an environment where proper instruction in Zen meditation can take place. 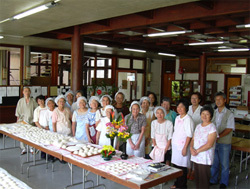 Priests and parishioners at Busshinji get ready for New Year by preparing decorative arrangements featuring glutinous-rice cakes. Almost 100 years has passed since the first Japanese immigrants came to Brazil. The current descendants are the fourth and fifth generations. Observing the memorial services held at the temples, one can see that they are attended not only by people of Japanese descent but also by those of western descent. It is also common for them to attend not just as friends but as members of the family. What people are looking for in Brazil is not just memorial services, funerals, weddings and prayers but something more candid—as in what it is exactly that Buddhism teaches. To these people who do not know Japanese culture, the parishioner system is a foreign concept. Memorial services are, of course, an important aspect of Buddhism. To understand the importance of one's ancestors, one must also understand Japanese culture. As noted above, Brazilians have an interest in Zen meditation, and not a few come to the temple to meditate. Zen meditation and memorial services are both parts of Sotoshu teachings, but we tend to think of them as separate things. 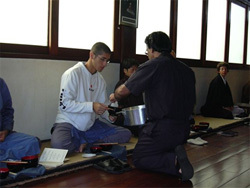 Zen meditation and memorial services or Brazilians of western descent and Brazilians of Japanese descent may appear different at first glance, but what are needed in South America are evangelistic activities that make no such distinction. These days, rapid scientific advances are taking place, and we now find ourselves in the age of the information society. The world is getting smaller, as evidenced by the fact that one can now travel from Japan to Brazil on the other side of the globe in 24 hours. The teachings of Our Two Founders are also spreading throughout the world. In this age of upheaval, we believe that it is the duty of the South America Office to come up with teaching activities that appeal to people of all backgrounds. South America is the furthest location on the globe from Japan, and not many will have the opportunity to visit. Nevertheless, it is a place that is full of enchantment. If you ever do have the opportunity to visit South America on business or for pleasure we would be delighted to hear from you and to have you stop by on your visit. Thank you in advance for your continued support. People from many parts of the continent assemble at Busshinji to participate in zazen at "Sesshin in South America."